Festival • Cigar-shaped dolmathes are full of flavor, but their most celebrated ingredient is the grape leaf. Chris Detrick | The Salt Lake Tribune Grape leaves used to make dolmathes. Chris Detrick | The Salt Lake Tribune Stuffed grape leaves, or dolmathes. It's nearly impossible to talk about Greek food and not mention stuffed grape leaves. These cigar-shaped rolls  called dolmathes  are a favorite meal in private homes, Mediterranean restaurants and at Salt Lake City's annual Greek Festival, where they are consumed by the thousands. "It's one of our ethnic staples," explained Sophie Wondolowski, one of the 50 or so church volunteers who stuffed and rolled nearly 30,000 delicacies for the four-day event, which runs Thursday through Sunday. Workers started with 1,200 pounds of ground beef and mixed in hundreds of pounds of dry rice, minced onions, oil, lemon juice, dried mint and other seasonings to make the filling, Wondolowski said. It took the helpers two and a half days to prepare the stuffed grape leaves  one of the festival's top-selling food items. But it doesn't matter how many of these bite-size parcels are rolled  there are rarely leftovers when the festival ends. "We always sell out," she said. Greek mystery • To those outside Greek culture, dolmathes might seem mysterious and exotic: Is there another food that calls for the tender leaves of the grape vine? Stuffed grape leaves can be served hot for dinner, or at room temperature as an appetizer, Wondolowski said. And the finger-size packages actually taste better the day after they are cooked, when their flavors have had time to develop. Dolmathes also are one of the few things in today's commercialized food world that don't taste as good when they're made by machine. Canned versions, with slimy green leaves and gooey rice filling, offer proof of the value of hand-made. Which makes dolmathes all the more intimidating, said Tony Tadros, whose family owns Holladay's Layala Mediterranean Grill. "I think people are afraid to make them at home." The appetizer menu at Layla features a vegetarian dolmathes, filled with rice, onion, tomatoes, parsley and mint. About once or twice a month, the dinner special is a version made with a combination of beef and lamb. Tadros said the restaurant sells about 300 dolmathes a week, each one loving rolled by his mother, Leila, by hand. "There are a few things on the menu she won't let us make  those are one of them," Tadros said of he and his siblings. Uncertain history • While Greeks have claimed stuffed grape leaves as their own, Tadros said it's not clear if they actually invented the dish, which is a staple in many Middle Eastern cultures. "You see one version or another in all the Arab countries," said Tadros, whose mother is Lebanese and father is Egyptian. He added that the word dolma is Turkish, which means filled or stuffed. No matter the country, the traditional filling is usually ground beef or lamb, but vegetarian versions with rice and spices  sometimes with the addition of pine nuts and currents  are common. There are as many spice combinations as cooks, Tadros said. Some add fresh mint and parsley to their filling, while others add cumin and allspice. The earliest recipes for dolmathes actually used fig and mulberry leaves. 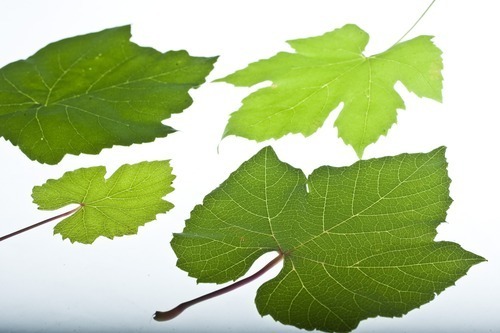 References to grape leaves didn't appear until the first century. Still, legend favors the Greeks, who claim stuffed grape leaves originated in Thebes, when the town was under siege by Alexander the Great and his army. Running out of food, resourceful townspeople minced the small amount of meat they had and rolled it in grape leaves. The leaves, which are rich in vitamins and other nutrients, may have helped them survive the occupation. Fact or fiction? Today's Greek-Americans don't worry about it. "If we didn't invent it, we did it better," joked Artiso Boutsakakis, owner of Salt Lake City's Aristo's Greek restaurant. "It's the quintessential Greek appetizer." P Greek food and pastries, youth dance performances, cooking demonstrations, church tours, historical exhibits and a 5K run/walk are all part of the 36th annual Salt Lake City Greek Festival. When • Thursday, Sept. 8, 5 -11 p.m.; Friday-Saturday, Sept. 9-10, 11 a.m.-11 p.m.; and Sunday, Sept. 11, 11 a.m.-8 p.m.
Where • Holy Trinity Greek Orthodox Cathedral, 279 S. 300 West, Salt Lake City. Admission • $3. Get a 2-for-1 coupon on the KUTV Facebook page. Bring a large pot of water to boil. Carefully separate the grape leaves. Blanch, in batches, for about 1 minute in boiling water. Rinse with cold water and drain. In a bowl, combine beef, rice, onion, tomato sauce, chopped herbs and seasonings. Mix well. Place a large leaf, vein side up on a work surface, with the stem end toward you. Cut the stem off. Place a generous teaspoon of the filling near the stem end. Fold the stem end up over the filling. Fold both sides of the leaf toward the middle. Roll into a tight cigar shape. Place seam-side down in the pot. Repeat with remaining leaves and filling, placing dolmathes tightly next to each other in the pan. When the bottom of the pot is filled, make a second layer. Squeeze lemon juice over dolmathes. Pour beef broth over dolmathes and then add enough water so that is about 1/2 inches above the dolmathes. Place an inverted heat-proof plate on top of the dolmathes to keep them from unrolling as they cook. Cover the pot and simmer for 1 hours and 15 minutes, or until rice is tender. Remove from heat and cool. 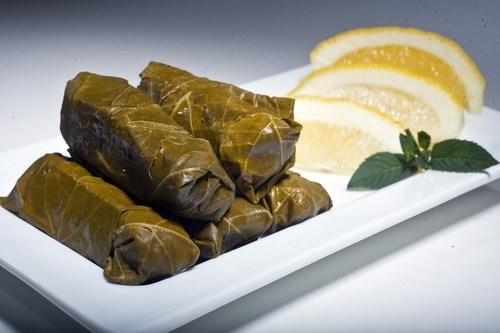 To serve, place dolmathes on a platter, garnished with lemon wedges. Serve hot as a dinner entree or cold as an appetizer. *Fresh grape leaves are more tender than jarred versions. If you have access to them, pick them when young and tender. They can be used immediately, just blanch in hot water for a 20-30 seconds before using. Fresh grape leaves also can be frozen for later use. In a large bowl, combine onions, fennel, scallion and salt. Work the mixture between your hands to wilt the vegetables. Stir the rice, dill, mint, 1/2 cup oil and plenty of pepper. Line the bottom of a large pot with the smaller and/or torn grape leaves. Place a large leaf, vein side up on a work surface, with the stem end toward you. Cut the stem off. Place a tablespoon of the filling near the stem. Fold the stem end up over the filling. Fold both sides toward the middle. Roll into a tight cigar shape. Place seam-side down in the pot. Repeat with remaining leaves and filling, placing dolmathes tightly next to each other. When the bottom of the pot is filled, make a second layer. Pour water, the remaining 1/2 cup oil and the lemon juice over dolmathes. The liquid should almost cover them. If it does not, add a little more water. Place an inverted heat-proof plate on top of the dolmathes to keep them from unrolling as they cook. Bring liquid to a boil. Cover and reduce heat to low. Simmer for 30 minutes or until the rice is cooked. Remove from heat. Cool and refrigerate overnight. Before serving, bring to room temperature. Arrange on a plate and served with lemon wedges or thick yogurt. Once you've made your filling, rolling dolmathes can be done in five easy steps. 1 • Place the grape leaf on a work surface with vein side up (shiny side down) and the stem end toward you. Cut the stem off with a knife or scissors. 2 • Put 1 tablespoon of the meat/rice filling near the stem end. 3 • Fold the stem end up over the filling. 4 • Fold both sides toward the middle. 5 • Roll into a tight cigar shape.